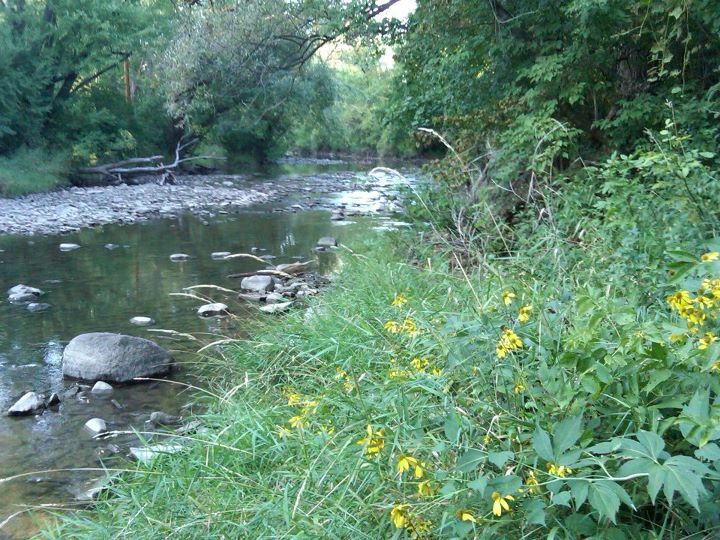 With all the wet weather we experienced in Michigan over the past several weeks, the mosquito problem has been terrible! The humid weather, likely compounded by the draw of our inground pool made my backyard especially susceptible to infestation. There were actually a few warm, humid weeks when I couldn't open the sliding door to our portico without being attacked! Even as the weather is cooling off, any spike in temperature seems to wake the flying pests with a fury. My husband and son went fishing this past weekend and, with the balmy temps, wouldn't have dreamed of going with out mosquito protection. Likewise, as my son attends football practice, with the practice field often moist and a bit on the shaggy side, or my daughter treks through wood and dale on her cross country runs, we make certain they are "treated" with repellent before hand. 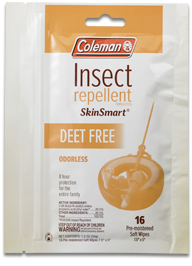 Recently given an opportunity to test the Coleman SkinSmart line of family friendly (DEET free) repellents from Coleman, SkinSmart has been put to the test for all our outdoor adventures over the last few weeks. Coleman SkinSmart is a patented new answer to protection from mosquitos and other biting insects. Formulated with active ingredient IR3535, SkinSmart is just as effective as products containing DEET, but unlike DEET based products, is safe for the whole family. SkinSmart is designed to be effective for up to eight hours and to dry quickly, without leaving any residue. My crew received both the SkinSmart aerosol and SkinSmart wipes to test. Most importantly, we found SkinSmart to keep us protected! While my husband and daughter are only mildly affected by mosquito bites, to keep my family safe from the diseases that can be transmitted, effective repellent is a must during mosquito season. My son and I, on the other hand, have fairly extreme reactions to mosquito bites, and SkinSmart kept the mosquitos at bay for us, as well. From a use perspective, the aerosol bottle did work in any position, making it much easier to apply to all one's exposed parts and pieces. The twist locking cap is a great feature, ensuring the repellent isn't released in your bag! For on the go, however, I loved the wipes! Each package is resealable and contains 16 wipes. Compact, with sturdy packaging, it is perfect for throwing in your bag or purse. I've used wipes from containers before, but found, even with the resealing cap on the container, that they had a tendency to dry out quickly and become unuseable. The SkinSmart wipes resealable packaging worked effectively to keep the unused wipes moist. Beyond the effectiveness and packaging benefits, I appreciated that the scent of SkinSmart was not offensive; for an insect repellent, not offensive is fairly significant. While it didn't smell like a bouquet of flowers, it did have a light scent that was mildly pleasant, with just a hint of "chemical". Most importantly, while we certainly did not intentionally inhale during application of the aerosol, the product was mild enough that my, sometimes dramatic, son did not fall to the ground feigning choking and gasping for air post application. Overall, we were quite pleased with SkinSmart. We found it effective, even in the worst mosquito conditions, with a non offensive scent and fantastic packaging. Coleman Repellents also offers Botanical Line of Repellents, Area & Gear Repellents, First Aid Kits, as well as Outdoor Accessories. Courtesy of Coleman Repellents, two lucky That's What She Said readers will win a set of SkinSmart DEET Free Repellents! While the mosquito season may be wrapping up in your area, no need to worry! Insect Repellent has a very long shelf life! Congrats to Kevin, comment #26 and nanjhall, comment #53. On behalf of Coleman SkinSmart and That's What She Said, thank you to all entrants for following and participating! I was provided with SkinSmart Repellents to explore for the purposes of creating this feature. The opinions above are both honest and my own. Images and information sourced from various Coleman Repellent sites. Facebook is not involved in nor responsible for this giveaway in any fashion. Sponsor is responsible for supplying and shipping prize. I'd like to try the spray on. When we are visiting my Dad in the Outer Banks the mosquitos can be terrible. It's breezy and aerosole tends to blow every which way but the one intended! I also entered your Dr. Scholl's giveaway. The Citronella lamp in this line looks good. I would like to try the wipes and I have yet to find them. I think they would be perfect for the face area where you do not want to use a spray. I would like the Coleman® Citronella Candle because it would be perfect for on my patio. I would like to try the Coleman® Yard & Camp Fogger to keep our camp bug free. Yard & Camp Fogger is one thing I would like to try and the clothes treatment is a different concept. I would love to try their Go Ready Sunscreen Pen. 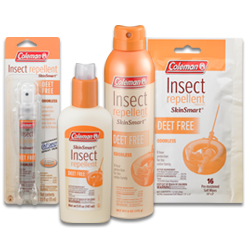 I would like to try the Coleman® SkinSmart® Insect Repellent. I have ten year old twins and strangely, one of them is a mosquito magnet. The other one hard ever gets bitten. But Hunter always ends up with horrible giant bites. He has been wearing long sleeve shirts to the bus stop since Hurricane Irene (and its been pretty hot). He also keeps asking me if he can die from mosquito bites. Poor kid. I'd like to try the Coleman® Botanicals Insect Repellent because I'm a fan of essential oils.